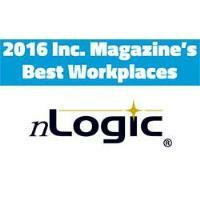 New York, NY (May 25, 2016) – Huntsville, Alabama-based nLogic listed to Inc.’s inaugural 50 Best Workplaces, the first such measurement of American companies with up to 500 employees that deploy state-of-the-art techniques to keep their staff happy and productive. nLogic is widely-recognized as a premier small-business provider of products/services to aerospace/defense customers including Army, Navy, Air Force, Defense Commissary Agency, Missile Defense Agency, Special Operations, NASA, and USDA. Our employees bring state-of-the-art skills in systems engineering, modeling/simulation, software, test/evaluation, IT, cybersecurity, and logistics. Our footprint includes Alabama, Virginia, California, Alaska, Colorado, Texas, New Mexico, and Tennessee. Certifications: ISO 9001:2008, AS9100C, CMM-I-Level-2, NIST-800-171, ITAR. The 2016 Inc. Best Workplaces Awards assessed applicants on a collection of multiple choice, scaled, and open-ended items. Responses were evaluated by the research team at Quantum Workplace. Core components of the scoring include company practices around management, employee recognition, performance communication, benefits, and other elements of the employee experience. To qualify, companies had to be U.S.-based, privately held, and independent--not subsidiaries or divisions of other companies. The minimum revenue required for 2015 is $2 million, in business at least three years, with full time employees count ranging between 5 and 500.